Forget about the tables and chairs. And the microscopes. And the 14,000 bird eggs in the ornithology collections. And the 60-plus live invertebrates that crawl, scuttle and buzz in the Bug Room gallery. Those are — relatively speaking — easy to move. What the Royal Alberta Museum really needed to worry about was the mammoth skeleton. How was the institution going to get the ancient tusked behemoth out the low doorways of the venerable old building it had outgrown just west of downtown Edmonton and into its glittering new $375.5-million home that occupies 38,000 square metres of prime real estate in the more central Arts District? By taking off its head, naturally. Six museum staffers detached the approximately 36-kilogram skull, lowered it to the ground with a scissor lift and … moved on to the next item. Logistical problems such as this one come with the territory when a museum decides to move, of course, but the sheer scale of the entire exercise can be hard for the public to wrap their minds around. To that end, the museum used a barcode system to keep track of what went out the old doors and in the new ones. 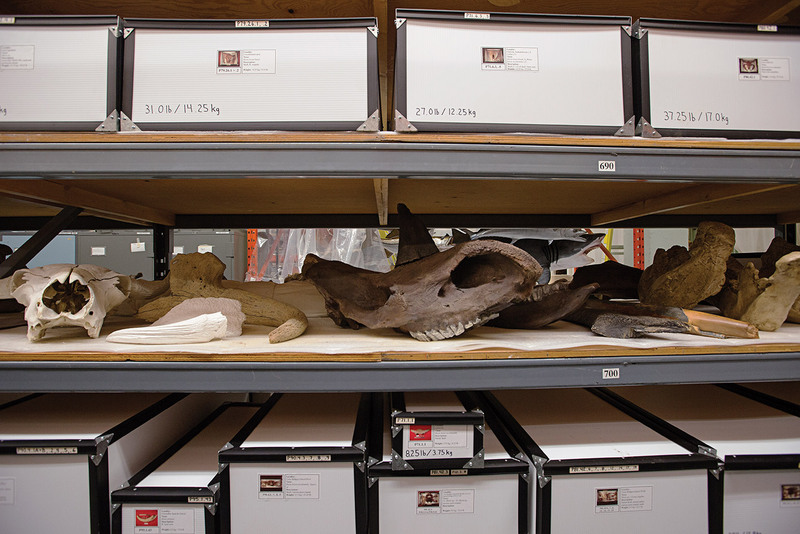 By mid-January 2018, for example, about 71,000 bar codes — “That’s 1.6 kilometres long,” says Robinson — had been applied to the approximately 422,000 artifacts and specimens that had been relocated by that time. 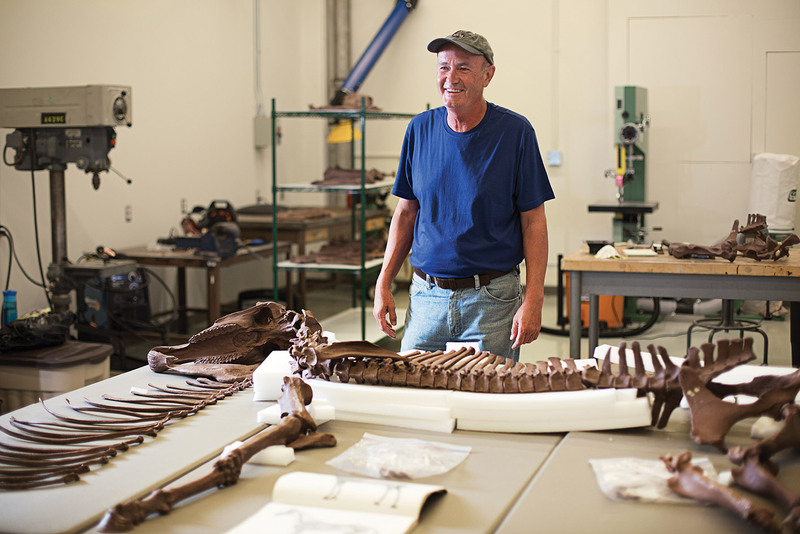 Paleontology exhibit specialist Peter Milot articulates a horse skeleton before packing it. 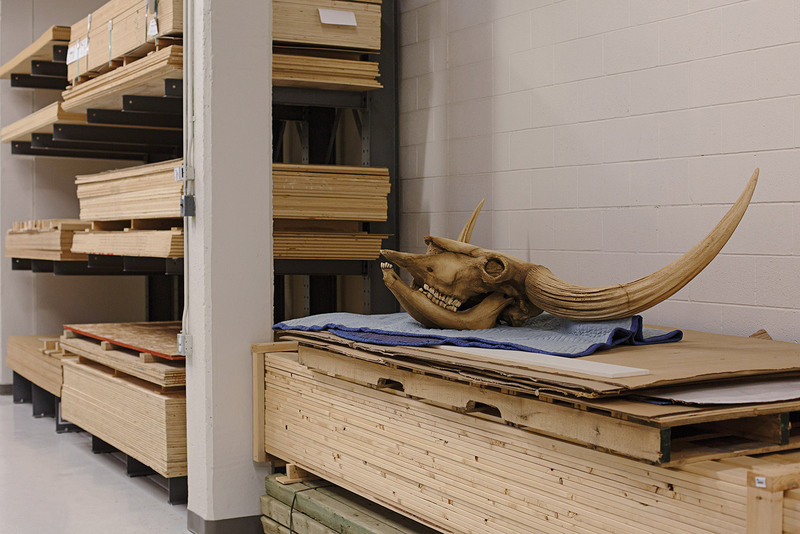 A giant bison skull sits atop crates, ready to be packed. 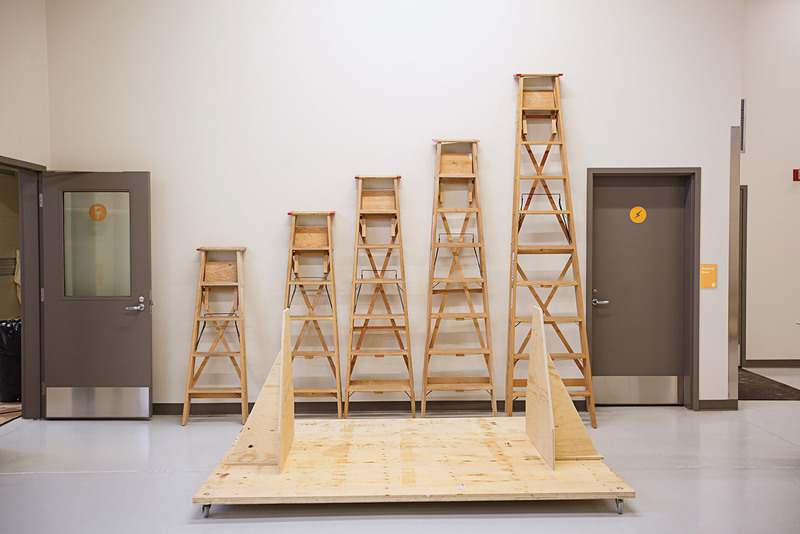 Ladders and part of a custom-made crate await use. 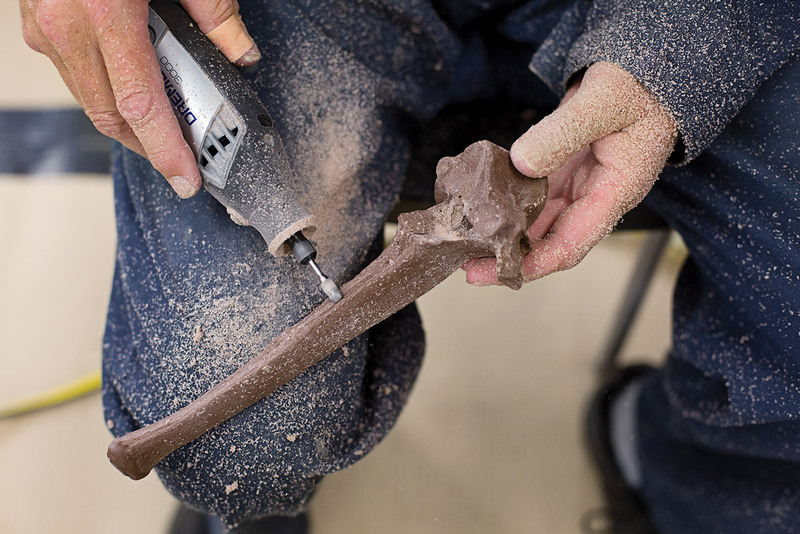 Peter Milot files away extra material from a cast of a bone before packing it. Boxes ready to be moved flank unpacked items in a storage room in the museum’s old building. 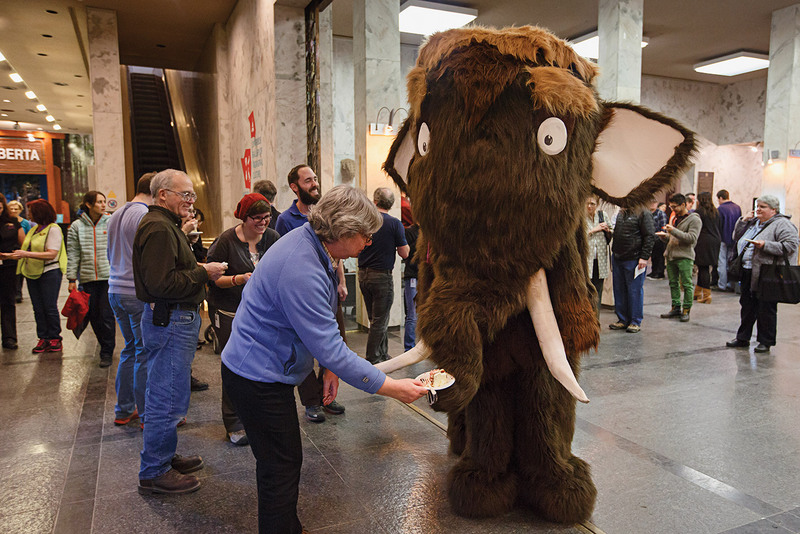 Museum mascot Moe the Mammoth sniffs a plate of cake during a goodbye party at the museum’s old building. 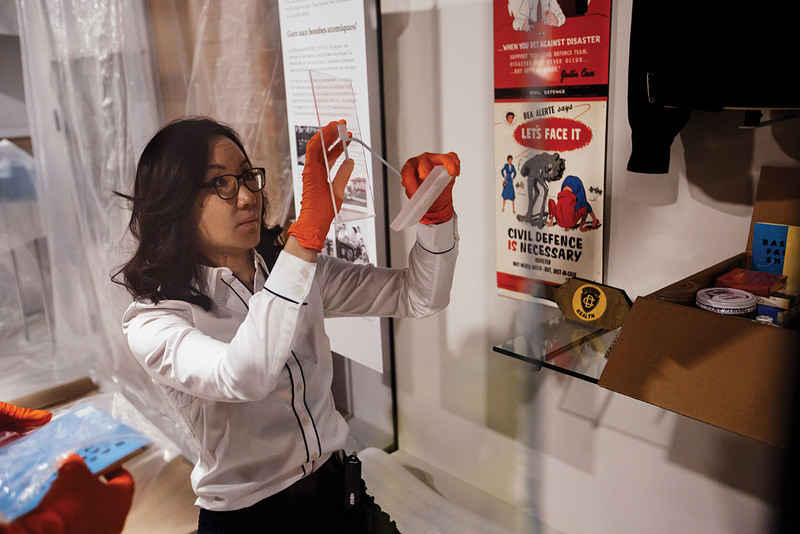 Carmen Li, the museum’s head of conservation, installs an exhibit at the new building. Embroidered mittens get a light-sensitivity test, part of the exhibit planning process at the museum’s new building. 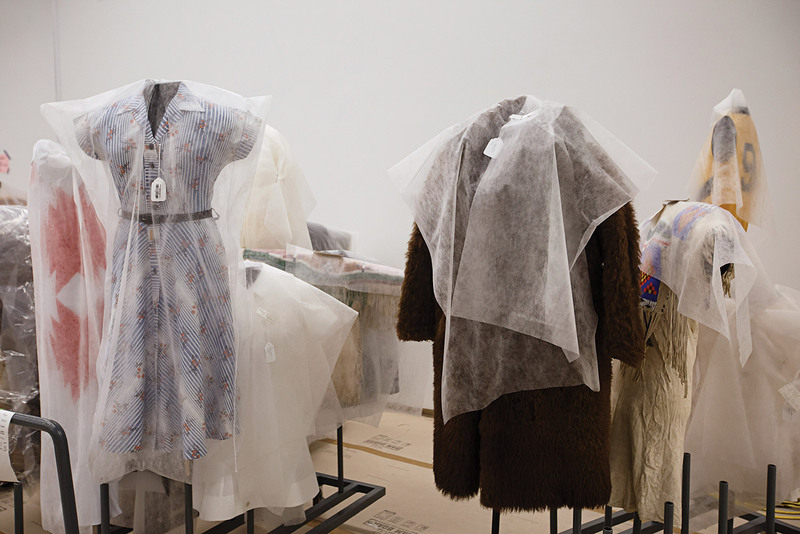 Protected clothing awaits display at the museum’s new building.